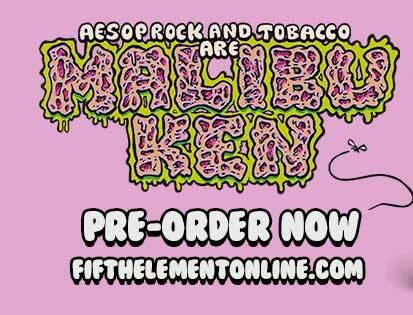 Huge news today… Aesop Rock & TOBACCO are Malibu Ken on their all new collaborative project!!! These two musical titans clash in a mesmerizing mesh of melodies and tongue twisters to totally tantalize your taste buds!! and they’ve only released one track so far… but, it has a video!! Lifted from the all new collaborative album “Malibu Ken” due out in January 2019!